Some of these nibs are downright awful, and some are wonderful. Can you tell which are which? Does the “Iridium Point Germany” stamp have any bearing on this? While visiting numerous online forums, receiving email queries, and speaking with clients of mine, I have quickly realized that there is a wide range of understanding as to what Iridium Point Germany (IPG) really means. Iridium Point Germany is a maker’s stamp that is placed mostly on steel nibs. Some people assume that all IPG nibs are manufactured in China. Some people assume that all IPG nibs are manufactured in Germany. Some people assume than an IPG nib is of lesser quality than another nib that is not stamped IPG. I would like to address as much of this issue as I can to clarify what IPG really means. First off, I would like to address the term “iridium”. Please regard iridium as a synonym for tipping material. The tip of a pen nib is rarely iridium, and almost never pure iridium. It is usually plathenium, osmiridium, or a various mixture of metals. So in the pen industry, understand that iridium is a term used to refer to tipping material, even though there is usually no iridium present. Back to IPG…IPG simply means that the iridium tipping material was purchased from Germany. Any nib manufacturer can buy their tipping material from Germany, manufacture their nibs anywhere that they want, and still stamp their nib IPG. This is not illegal. In this case, the “Germany” part of IPG is referring to the tipping material. If “Made in Germany” were stamped on a nib that was not made in Germany, then this would not be lawful. So what does this really mean? It means that any nib made to any quality standards can be stamped IPG. In the end, it means that the consumer may need to hold the IPG nib and/or pen manufacturer responsible for disclosing the origin of their nibs, despite what has been stamped. 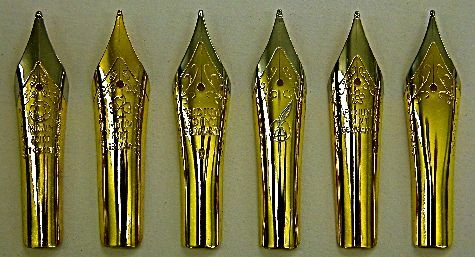 I have worked with steel IPG nibs and gold nibs that are made in India or China, and the quality is usually poor. I can pick out 10 nibs, and only 5 are acceptable. And by acceptable, I only mean that I can tune them to write well. 9 out of 10 will not write well without tuning. I have also worked with IPG nibs that are manufactured in Germany whose quality control are just as good as any other nib manufacturer in the world. 10 out of 10 will be wonderful nibs. But even with nibs coming from these German companies, there might be a very rare issue that does need additional tuning or attention. I can’t remember a German-made IPG nib that I couldn’t tune to write well at all, and I just gave up, throwing it in the trash. I can’t say the same for the Chinese or Indian IPG nibs. Then to confuse the issue more, some steel nibs have no markings at all. In summary, IPG can be deceptive. Any nib manufacturer can buy their tipping material from Germany, and then legally put IPG on their nibs to make them appear as a higher quality than what they may be. JoWo and Bock are the two big German nib companies that distribute. They both manufacture excellent nibs. Clearly, some the best nibs in the world come from these two companies. One might ask, “What about Schmidt”. Schmidt does not manufacture nibs. Schmidt buys their nibs from JoWo and Bock and then they assemble and distribute. When it comes to pen manufactures that make their own nibs in-house such at Montblanc, Pelikan, Nakaya, etc., the country of origin is no mystery. No need to cover this topic, as long as the company clearly states the origin of their nibs. As president of the Edison Pen Company, I would like to state that all of my nibs receive a tuning and writing test personally by me before shipping. Whether they are stamped IPG or not, I use only German-made nibs of the best quality. Even though my nib manufacturer offers nibs among the best in the world, I don’t want the rare defect to be on one of my pens, hence the tuning and writing test. My opinion is that any nib, manufactured by any company, benefits by being checked and tested before going to the consumer. My experience is that without testing, any given nib can have small fluctuations in flow, smoothness, feedback, feed alignment, or tine alignment, leading to variation of the writing experience. So what does this all mean in the end? It is never safe to assume that IPG has any bearing on quality. If a manufacturer or distributor is not forthcoming with the origin of their nib, then your next recourse is to grab your loupe. I recommend a 10, 15, 20 or 30x loupe. I personally prefer a 15 or 20x lighted loupe. I will outline 5 items of importance. Disclaimer – the following comments and photos are my own interpretation of how I like to tune nibs, what I look for in a good nib, and my personal philosophy of nib tuning. The following is typical of what I shoot for when tuning nibs to be a general smooth writer with 6-7 of 10 flow, and what I like to see out of the box. A fountain pen user may wish to have the nib adjusted for an oblique writing style, a drier/heavier flow, additional tooth, high/low writing angle, etc. In these cases, some of what you are about to see would not apply. The following simply applies to a good standard nib, and what I shoot for in making most nibs good for most people. The following should not be expected to be a rule for what is right for everyone. The following also applies to a typical German-made #6 nib. The following does not necessarily apply to every nib manufacturer, especially some Japanese-made nibs whose setup can be very different than mine. 1) Look at the tines with them pointing directly at you, as if you were about to stab your eye. Are they touching? If so, are they touching on the top, but not the bottom? Bottom, but not the top? Is there a gap? Is it real significant? Are they aligned? Tines that are touching and making complete contact on the entire surface are usually acceptable. A very slight gap is also OK. A large gap is not acceptable. If the tines are touching on the top, with a very slight gap on the bottom, this is also OK (please note – this is not “baby-bottom” as long as the insides of the tines are not rounded, and the gap is very slight). If the tines are touching on the bottom, but not the top, this is not usually desirable. If the tines are misaligned, this is not good. These tines are clearly misaligned when magnified. Without magnification, this is not easy to see. 95% of “smoothness” problems is exactly what you see above. The tines do not usually need smoothed, just realigned. These tines have a large gap. The alignment on these tines are pretty good, but the left tine is just a touch high. This will probably not effect the nib, however. This looks pretty good, but I would still bump the right tine up just a touch. These tines are perfectly aligned. This nib is probably perfectly fine. I would prefer to see a little tiny gap at the bottom, however. My opinion is that these tines are ideal. The alignment is perfect, with a very small gap on the bottom. 2) Take a look at the slit. The slit should narrow slightly, or at least be equidistant from the breather hole to the end of the tines. 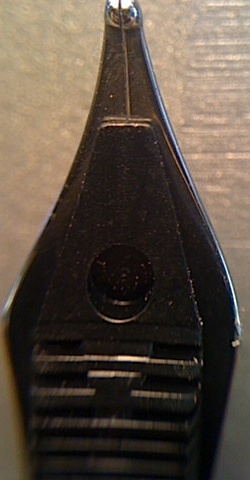 The slit of this nib is widening to the tip. Definitely some flow problems here. The slit of this nib is narrowing to the tip. This is good. 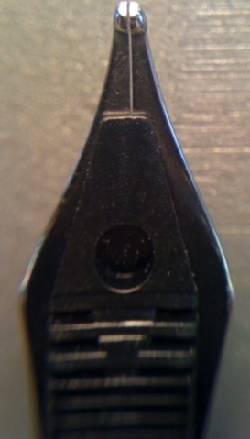 3) Looking from the side, take a look at the contact that is made between the feed and nib. There should be contact. If you can see space between the feed and nib, you will most likely have flow issues. Try to fit a piece of paper in between the nib and feed. It should not be able to fit. The feed and nib are not in contact with each other at the tip of the feed. This is not good. The feed and nib are in contact throughout the entire length of the feed. This is good. 4) Take a look at the alignment of the feed in relation to the nib. With the nib pointing towards the sky and the feed facing you, view the nib and feed, and see if it appears to be going right up the center or the tines. Turn the nib over, and look at how the feed channel aligns through the breather hole. This will certainly take magnification, but you should be able to see the feed channel going right through the center of the breather hole. Some nibs don’t have breather holes, so this step would be impossible in this case. This feed is misaligned to the left slightly. The feed is going straight up the center of the nib. This is good. 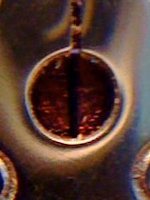 Difficult to see without magnification, but the feed channel on this feed is misaligned to the left of the breather hole. The feed channel of this feed is aligned right down the center of the breather hole. 5) This is probably the most important item. If you can, INK IT UP AND WRITE WITH IT! All four items outlined above are very important to understanding what makes a good nib, but they mean very little if the pen writes exactly how you want it to! The only problem with this is that you don’t always have this opportunity. So bottom line, it’s generally safe to say that IPG nibs manufactured in Germany have better quality control than IPG nibs made in China or India. At least my experience has consistently pointed in this direction. However, can a Chinese or Indian-made nib write as well? Yes, but it’s hit and miss, and even the hits usually take more tuning and work. If you have little or no nib tuning experience, then try the tips above using your loupe when selecting an IPG (or any) nib. That being said, finding a German-made IPG nib is a safer choice if you don’t have the nib in-hand to inspect. So does the IPG stamp have any bearing on quality? It’s safe to say no. Please note – this, along with all of my articles, is based on my personal experiences and is not intended to be authoritative. If you feel that something is factually incorrect, I’m always striving for the most accurate information to give and receive from the pen community. I welcome emails and comments regarding.